Those of us who scan the shores of the North Atlantic are privileged to occasionally encounter that most pulchritudinous of pelagic birds, the Northern Gannet. This seabird in the Family Sulidae is kin to the booby and lethal to any fish foolish enough to feed close to the ocean’s surface; the daring plunge dives of gannets seem death-defying but, thanks to physiological adaptations, the only threat involved is to their prey. Not only are Northern Gannets the largest seabirds in their range, they place among the most handsome. These sleek seafarers are, in their adult plumage, snow white tipped with black at the wings and crowned with a terrific toasted almond glow. That orange coloration is set off beautifully by a slate blue bill and deepset eyes. Juveniles begin dark brown and lighten up year after year. 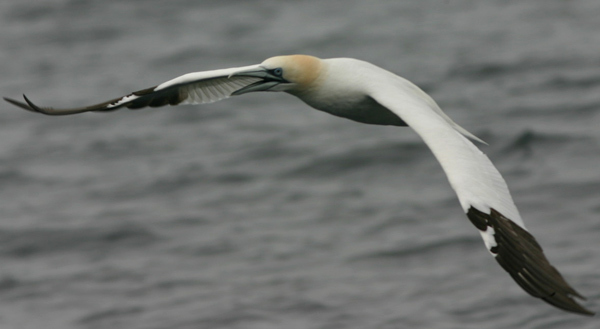 Gannets are quite populous along the Atlantic coastline stretching from the southern United States up through Greenland and Iceland and through Europe down to north Africa. These colony nesters suffered significant population declines in the past but are doing much better today. No wonder… their combination of good looks, aerial grace, and plunge diving theatrics make them, at least in my opinion, the most impressive birds in any chum slick. I have found two sick juvinile northern gannets on the same beach in Maine in the past 3 weeks. The first I took to York, ME to the wildlife rehab. He died after 5 days of tubal feeding and intensive care. The one I found yesterday exibited the same symptoms. A sort of neurolgical daze, I suppose is the best way to describe it. I put yesterdays bird up into the shade of the beach grass in a small stream. This morning when I returned, he had moved back down into the sun and sand. He was just sitting there in a daze. After several attempts (and getting bit..lol) I managed to get some fresh water and bits of haddock into his gullet. This seemed to “wake” him up and he “remembered” what he was supposed be doing..he spent 15 min trying to get to the surf and after making his way into the water, he began swimming, preening, looking around, raising his head to avoid being splashed in the face…. They are getting into some kind of toxin. On Thursday 8/10, we found a juvenile Northern Gannet washed up on the beach. We first knew he was not well when we saw him in deeper waters drifting close to bathers. We had to shoo off Herring gulls who were diving on him. One wing appeared to have a wound, but he had full range of motion. We threw a blamket over him and took him to Cedar Run Wildlife animal shelter about an hour away. He also seemed to be in a daze. A lot of flotsam has been floating in with the offshore winds. My guess is that he was floating for a long time. Hoping he will be OK.
Is there a gannet that has black top wing feathers that go from wing tip to wing tip? 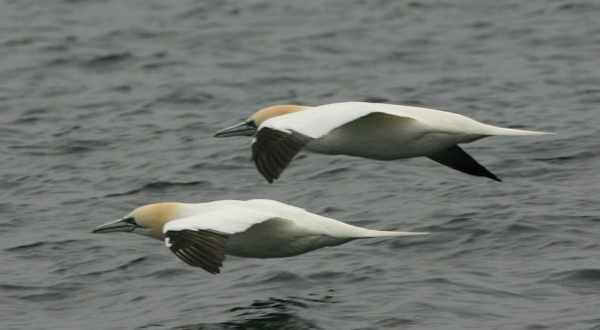 I took an extra long telephoto picture of diving birds off the beach and was told by the local museum they were gannets. However I checked Google for pictures, and didn’t find any. 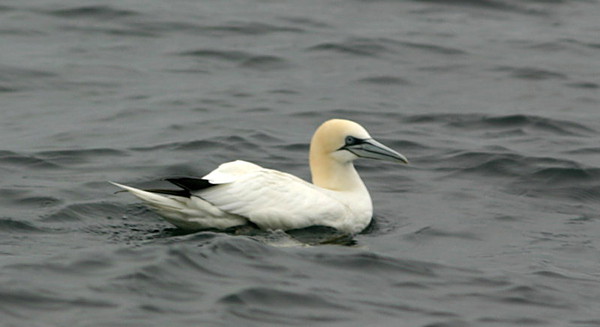 John, young Gannets are much darker than adults. If you would like to mail me a photo I’d be happy to have a look? Charlie. Immature Northern Gannet spotted at Cherry Street and Lakeshore Blvd East in Toronto Friday November 12 at noon. 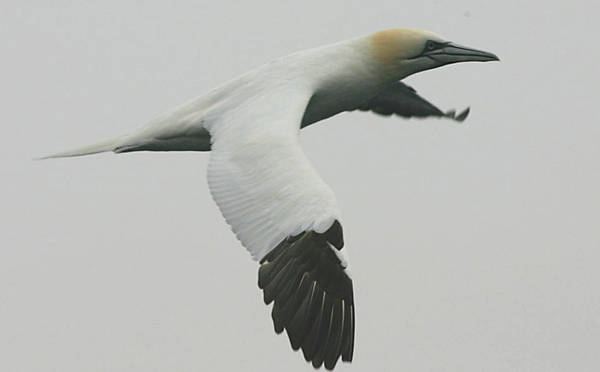 I saw a migrating gannet do a spectacular dive from 50′ up. He must have hit the water at 20 mph. He was in Apalachicola Bay (just off Dog Island in Northern Florida). The only time that we are lucky enough to see these birds are in the fall and spring when they pass through. What luck! I saw a large white bird with black wingtips flying over the Rappahannock River in Virginia.Very exciting, but couldn’t get close look as I was going over a bridge. Could it be anything else? I moved from a city in Ontario, Canada to Cape Breton Island last year and live on the ocean. While on the beach one extremely calm and particularly silent morning I was watching the birds on an island just off my property when all of a sudden, I heard what my ‘city’ brain thought must be a fighter jet overhead. It was so loud compared to the silence that surrounded me that I flinched and looked skyward anticipating some sort of military plane. What I saw was a Northern Gannet plunging from 100 feet and disappearing into the ocean with hardly a splash. What my brain interpreted as the noise of a jet fighter was actually the vibration of the wing feathers as this magnificent bird dove at 50 mph. A few seconds later, it surfaced with a snack dangling from it’s beak. I watched it take off again and repeat this scene about 10 times before moving on up the coastline. Over the last few weeks, I have had the great pleasure of sharing my coastline with this fascinating bird. Ya they are pretty amazing birds! !